Like parents everywhere, my main concern is spotting the signs that my foal has been radicalised. Morris has been showing some very worrying signs recently. It all began with his reading of T.E.Lawrence’s “Seven Pillars of Wisdom”. 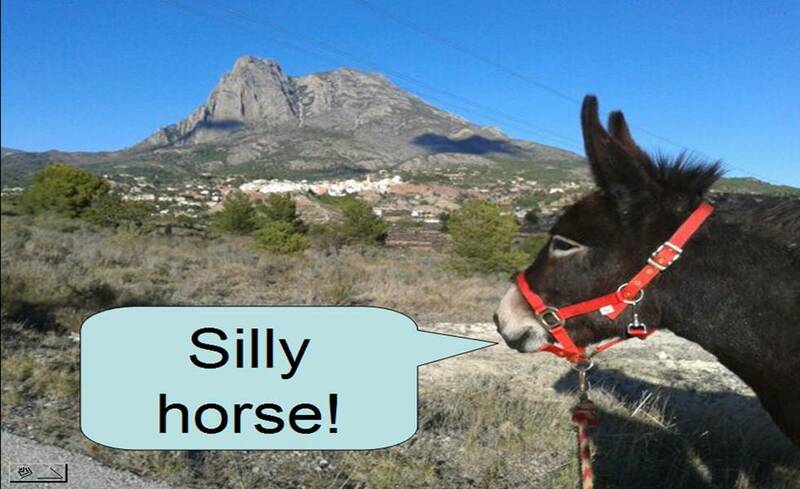 Here on the Costa Blanca at 10 am today, life continued on the donkey field as the Guardia Civil swooped and arrested dozens of members of the ruling Popular Party and raided PP party offices, in the usual traditional corruption scandals which are such a colourful part of Spanish culture. Last night’s Panorama on UK television’s BBC1, showed how the Russian Mafia and Vladimir Putin are also happily involved in the Costa Blanca. That is not much of a problem on the donkey field either. No, what we really worry about here on the donkey field is the radicalisation of our youth. When Matilde and I gave birth to our foals in 2011 we simply expected them to grow up as normal young donkeys in a regular paddock routine – focused on the delivery of straw, alfalfa and carrots – and a simple social life of chasing each other around the field, damaging vegetation, kicking loose plastic buckets, biting each other, and occasionally wrecking the stable. What we did not expect was extremism. Unfortunately, Morris has taught himself to read, then became over-interested in the Middle East. His fascination with Lawrence of Arabia led to several weeks in the summer trotting around the paddock wearing a tea-towel tied with a pseudo-keffiyeh on his head. He tried chasing Matilde out of the field, accusing her of being a Turk. This caused great distress to Matilde, particularly when her daughter Aitana also began calling her mother a Turk. Morris had clearly been radicalising his girlfriend Aitana. We just hope they will not suddenly run off to the Middle East and start some donkey violent rampage of norty kicking and roodness aimed at de-stabilising western interests. Clearly, Lawrence of Arabia was a sheep in camel’s clothing and we should never have given him a Lewis gun and a Rolls Royce armoured car. It was his fault the Arabs gained a sense of identity. They never were friendly towards donkeys. But I do wonder, in my simple donkey way, is this word “radicalisation” the appropriate word? What is a radical? When the news reports young people being “radicalised” it is now seen as a very Bad Thing. Yet a “radical” is someone who (Latin rādīcālis; rādīx = root) wants to go back to the beginnings, the origins of a faith or idea system. That seems to be a Good Thing. Let’s teach these norty rood little foals a proper radical lesson about proper basic radical things: life on the field is about straw, alfalfa, carrots and generally wrecking the fences and stable. A true radical affirms the simple things in life. Leave your Middle East nonsense out of it, guys. Reading is so dangerous..take those norty books away!! NOW!! Clearly, T.E.Lawrence’s ideas about the Arab rebellion are the main reason why we now have Islamic State. Therefore the Foreign Office and MI6 have a lot to answer for.